Everyone here at McCormick Orthodontics goes above and beyond to make sure you have an amazing experience. If we can answer any question or do anything to make you comfortable, please ask. Bienvenue! Comment pouvons nous vous aider? I have been a member of the McOrtho team since the summer of 2008. Currently I am the Office Manager, but I’ve worn many hats in the office! When I started with the practice, I worked in lab and sterilization. Then I took on a role in Marketing and Community Education, working very closely with the local schools. I also did Treatment Coordinating before moving into my current role. I enjoy working at McCormick Orthodontics because I work with amazing doctors, a fun team and an amazing patient base. Every day is different and it keeps my job exciting! Outside of the office I enjoy spending time with my husband, Jeff, who I met in middle school. We have one child, Sadie, that keeps us on our toes! We enjoy spending our time together going to concerts, sporting events and traveling anywhere we have the opportunity to go! I am the Clinical Supervisor and I have been with McCormick Orthodontics since 2004. I absolutely love what I do. To see the beginning and end results and smiles when patients are finished is amazing and rewarding! I grew up here in the Oxford area and so did my husband, Jeff. We have three children, two of which have completed treatment at McCormick’s and one is currently in treatment. My son, Louie, is a Marine, my oldest daughter, Dali, is in college for Nursing and my youngest, Jekelle, is in middle school. I love to travel whenever I can, but I love to be home too because I love spending time with my family. I also love gardening and according to my coworkers, I make a pretty mean salsa! 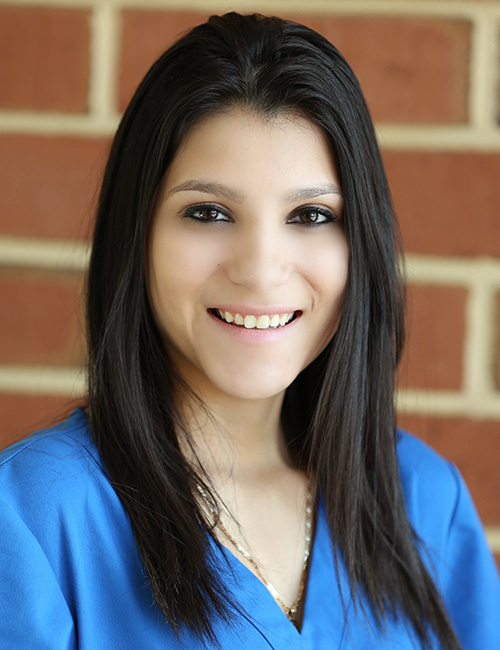 My name is Charrity; I am a Treatment Coordinator at McCormicks and have been with the practice since June 2014. I absolutely love my job! I really enjoy getting to meet so many new patients every day. I also love working with such an awesome group of women. Not only do I work here, but I was also a patient of Dr. Joe McCormick when I was younger! When I’m not working at McCormicks, I sing in an acoustic band and perform locally several times a month. In my spare time I love to spend time with my husband and kids. I have the pleasure of being a Treatment Coordinator here at McCormick Orthodontics. Not only am I grateful to work with such a amazingly unique group of people, I am grateful to meet such wonderful families everyday and help them understand what their orthodontic experience will be like. While I am not at McCormick’s I try to spend as much time as I can outside – from going on a run, playing in the snow, to taking a hike with my dogs. I just love to be active and outside! I have been a part of the McCormick Orthodontic team for almost one year now, but I have been in the dental field for almost 2 years and I LOVE it! I’m originally from North East, MD, but have lived in Delaware now for the past 10 years. I just recently purchased my first house with my boyfriend, Michael. We have 2 Chihuahuas (Kali and Lily). In our spare time we like to take our dogs to the dog park, go the movies, and spend time with our family. An interesting fact about my self is that I am 1 of 9 children. I would love to go back to school and become a dentist. My name is Ana. I became a member of McCormick Orthodontics back in 2013. When I joined the McOrtho team, I was a clinical assistant. I am now the in-house lab manager and am responsible for making many of the appliances that our patients are treated with. I was treated by Dr. Joe and I am now being treated again by Dr. Chaela (and I’m almost ready to get my braces off). I am a mother to two wonderful kids, Leo and Julia. I love watching soccer and spending lots time with my family. I also have two pet parakeets. I am a dental assistant with Dr. Chaela and Dr. Dave. I have been with the practice since July 2015. I wanted to share a little bit about myself with you so that you feel like you know me when you come in for your appointment! My name is Brianna. I completed the Dental Assisting Program at Lancaster County Career and Technology Center in 2015 and joined the McCormick team in 2016 as a Clinical Assistant. I did All-Star Competitive Cheerleading for 4 years. I absolutely love dogs, and I have one spoiled little Yorkie of my own! I also enjoy going to the beach and having bonfires with my friends. I’m a Dental Assistant and I also work in Records. If you are a new patient, I may be the first person you meet when you come into the office! My husband, Hector and I have two children. Our first baby is a four-legged French bulldog named Sata. Our two-legged baby, Myles, came a couple of years after and is now going on three. I’ve been with the practice since October 2005. I love to read, watch The Walking Dead and Game of Thrones. I research everything before I make a commitment to it. I also love learning new things, especially from our patients who are absolutely awesome! My name is Jacque; I am a Dental Assistant at McCormick Orthodontics. I started working here in September of 2017. I am honored and blessed to work with such an amazing group of people. I love what I do and enjoy meeting all the patients! Originally I am from Albuquerque, New Mexico; which is where I completed my education at PIMA Medical Institute. I moved to Pennsylvania in 2011 and moved back to New Mexico in 2016 after I graduated high school. I was there for a year before I decided to come back to Pennsylvania. In my free time I enjoy doing new things and exploring new places with my close friends but also enjoy staying in with my family and just relaxing in the comfort of my own home. My name is Jennifer. I went to YTI and completed the dental assistant program in 2017. I got hired to the Mccormick Orthodontic team during my externship. I was born at West Chester Hospital but lived in Oxford my whole life. I also have a 3 year old daughter. I love shopping, hanging out with my family and going on beach trips. I have been with McCormick Orthodontics since 2015. I completed my externship with eh office and was hired on as a team member at the completion of the externship. I love working here with such a great team. Everyone here is so helpful and we all help each other out. I currently work in Lab and the Records Department. I have lived here in Oxford, Pennsylvania for most of my life. Something you should know about me is that I love going to the dentist just for my regularly check-up. Also, I’m a big Pokémon fan! I am a Clinical Assistant here at McCormick Orthodontics and started here when I was 19. When I was 21 Dr. Joe McCormick treated me. I am blessed to have a job that I truly enjoy coming to each day. Everyday is exciting and new. I work with a great team and I enjoy seeing all the patients. My husband, Kevin and I have been together since eighth grade and have been married for 14 years. We have with 3 children, Brandon, Caleigh and Cameron. I love spending time with my family outside of work. I’ve enjoyed working at McCormick’s since the fall of 1992. I started out as a receptionist and now I am the Financial Coordinator. I grew up in the Oxford area. I have a son, Derek and a daughter, Nikki. Both of my kids were treated by Dr. Joe. I am a huge fan of the Philadelphia Phillies and I also love to watch tennis. In the summer I love working outside, sitting on my patio and going to the beach. I am the assistant bookkeeper at McCormick Orthodontics. I’m very new to the practice, but hope to be a part of it for as long as some of the veterans here. I love working with the staff to help patients have an enjoyable and memorable experience throughout their treatment. I am an Oxfordian, born and raised. I come from a very large family; some of who have been treated at the practice. In my down time I enjoy reading, painting, and spending time with my many nieces and nephews! I have been working at McCormick Orthodontics since November 1997 as the Insurance Coordinator. One of my favorite memories of working at McCormick Orthodontics was the team trip we took to Ireland. It was a great experience! I enjoy spending my free time with my husband, Tom and my two sons and their families. My name is Jen, and I am a receptionist with McCormick Orthodontics. I recently joined the McCormick team after staying home with my children for the past couple of years, and am learning so much every day! I live in Conowingo, Maryland with my husband of 11 years, Warren, and our two children, Madelyn and Webby. Outside of work I enjoy spending time with my family, watching my children play sports and going to Hershey Park. I have been apart of the McCormick team since the fall of 2014 and I’ve had multiple roles. I began my time here in lab and sterilization and in the financial department, trained at the front desk and I am now taking on some responsibilities in marketing. I’ve been married to my husband Chad, for 17 years, we were high school sweethearts. We have 5 awesome children Ben, Claire, Sam, Grace and Lillie. In my free time I like to hike and go to the beach whenever I get chance. I am a receptionist at McCormick Orthodontics. I have been employed with the practice since 1986. I guess you can tell I love my job, and working with the doctors, the staff and our wonderful families. Two generations of my family, my three children and three grandchildren have had orthodontic treatment here at the office. It was an investment of a lifetime and one I would never regret. Outside of work I enjoy spending time with my husband, 3 grown children and my 5 grandchildren. I enjoy road trips with my husband, Phil, on our motorcycle, reading, baking & cooking and spending time with my family. I also enjoy visiting Tennessee and Virginia, where most of my immediate family resides.